I taught myself how to knit in 2000 and when I knit, I knit obsessively. I went off knitting for some reason- oh, right! I started sewing obsessively- and now I’m back with a fury. How I balance these two is what scares me. I do need to sleep and all. Knitting does give me a chance to reflect on a sewing project, or as in the case with some patterns I’ve encountered, given me a way to add a vintage flair in the accessory realm. 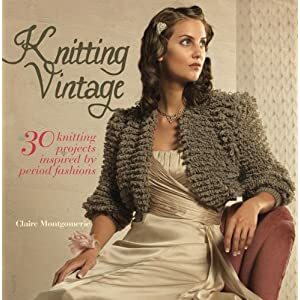 I like the historical information in Knitting Vintage. It isn’t overwhelming but there’s enough detail to get a budding vintage knitter interested in exploring more. There are a lot of sweaters but I think I need to finish the sweater I’m working on first. 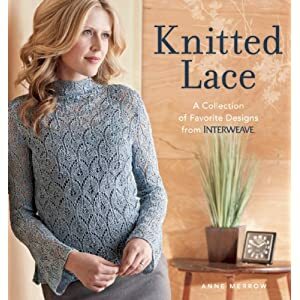 The next book isn’t labeled as a vintage knitting book but I thought I’d include it anyway since it’s got some beautiful lace patterns from the Interweave peeps. And look at the lace stockings they included. These I will make, though I’ll probably add more length. These stockings are what made the vintage cry for me. Or maybe it was just the shoes. This final book is an interesting one. This book was originally published in 1985. What you get, then, is a book with vintage patterns, done up in 80’s styling, which actually helps you see how much styles repeat. 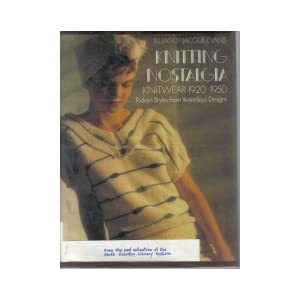 The pattern on the front cover is from 1934 but it really looks oh-so-80’s as well. From this book, I’ll probably go for another turban. What I especially like is the pattern for this turban, opposed to the Emerald Turban I mentioned earlier, also has a snood attached. I like that look as well. Off I go to do some more knitting. I do have some sewing to do but I’m at a point where I really just need it quiet in order to push through. Maybe the weekend? We’ll see. The stockings are lovely. I’d be interested to see how they turn out. You would definitely need a pair of those shoes to wear with them. Agreed, those stockings are lovely. So once I’ve finished this prayer shawl, what’s a smaller but lovely project you’d recommend for a beginning knitter? I think I’ve caught the knit bug, but I can’t commit to these large projects… gotta have time to sew too!!! Might be fun to knit something small, like a dishcloth, but with a spin that I know will hold your interest. I’m going to be making a whole set of them as a gift. If you need help, let me know. omg Leila, you are the BEST. I love these patterns and you are right – they are the perfect little project with a spin. Thank you SO much! I also happened to get a free ball of yarn today at the shop, so I will use it for this dishcloth. I’ll send you a photo once it’s done! So excited!!! Nothing better than Doctor Who & crafts!! !